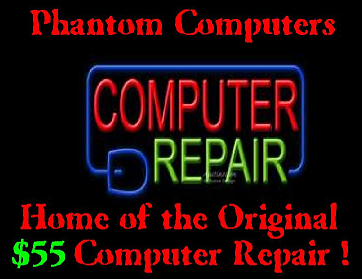 Phantom Computer Systems prides its self on “ providing the service you deserve at prices you can afford”. It seems that many of the “Other” local computer shops provide you with pro rated services at extended service rates. Phantom Computer Systems provides you the lowest service rates and the best quality you’ll find. Its really simple, no gimmicks no nonsense, just low flat rate labor rates! Regular labor rate is a flat rate fee Per instance, unless otherwise noted. * Parts and other consumables extra. This why we say, At Phantom Computers you get the service you deserve at prices you can afford! For more pricing information see: Services Page.